Louise has been with SJEA since Dr. Cole founded his practice in 1975. 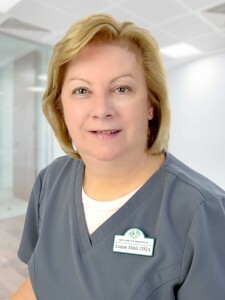 A highly experienced certified paraoptometric assistant, Louise currently works as our surgical coordinator and is responsible for the scheduling and preparation of patients for cataract surgery. She is also trained in the use of ultrasound imaging equipment which we utilize to diagnose many diseases and injuries of the eye. Louise lives with her husband Chuck in Hopewell where they raised their daughters, Britney and Ashleigh.